Today’s special post is in honor of the great city of Gdansk, Poland, destination of over 40% of the UNRRA livestock shipments. My Polish friend Grace, who lives near and works in Gdansk, recently noted that the city would be observing the 70th anniversary of the “liberation” of Gdansk on March 31. World War II started there with an attack by Nazi Germany on September 1, 1939, and Germany annexed the city. Gdansk remained under German control until the Russian Red Army came through the end of March 1945 and pushed the Germans out. The city, then known as Danzig, was utterly destroyed in the process. Only six months later, the first UNRRA livestock shipment to Poland arrived in Nowy Port, the port area for Gdansk, making the seagoing cowboys some of the first U.S. civilians to step foot on Polish soil after the war. With their work of tending the livestock finished when the animals were off-loaded, they had time to explore the area. Many of them captured the devastation of this great city with their cameras. These seagoing cowboys of the SS Virginian were the first cowboys to tour post-war Gdansk, early October 1945. Photo courtesy of Harry Kauffman. 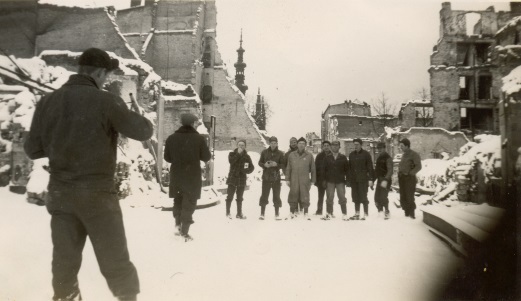 The Morgantown Victory crew explores Gdansk the end of December 1945. Photo courtesy of Hugh Ehrman. The people of Gdansk were determined to rebuild the historic center of the city as it had been before the war. Today, Gdansk is a lovely, vibrant city. Gdansk rebuilt. October 2013. Photo: Peggy Reiff Miller. Gdansk, may you always be free.